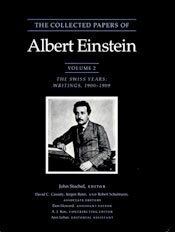 This volume contains the scientific work Einstein published during the first decade of his career, and includes some of the most significant achievements of 20th century physics. The first paper was written in 1900 by the 21 year old Einstein, newly graduated from the Swiss Federal Polytechnic in Zurich and still searching in vain for a job. The last paper in this volume is the text of an invited lecture given in 1909 to a major scientific meeting by Einstein after he was appointed to his first academic post at the University of Zurich. He had already been recognized as an important theoretical physicist on the basis of the work reprinted here, particularly the three masterpieces that appeared in quick succession during 1905, Einstein's year of miracles. In one of these papers Einstein showed how one could finally confirm the ancient view that matter is composed of discrete atoms, and even measure the numbers and masses of these atoms. In a second paper, which even he referred to as ''very revolutionary,'' he argued that the observed properties of thermal radiation suggest that it consists not of waves, but rather of localized particles of energy which he called energy quanta. The third and most famous paper set forth the special theory of relativity, solving some long-standing difficulties, but requiring a significant change in our understanding of those basic concepts, space and time. "Here in Pasadena it is like Paradise. Always sunshine and clear air, gardens with palms and pepper trees and friendly people who smile at one and ask for autographs."